Today I have a new trip report from a first-time planner which includes lot of extra options that many of us don't get to do so it's fun to hear how that worked out on this December trip. I also have a quick tip for families planning to use a stroller during their trip. Gina and her family (including her parents, husband, and children) traveled just after Thanksgiving. 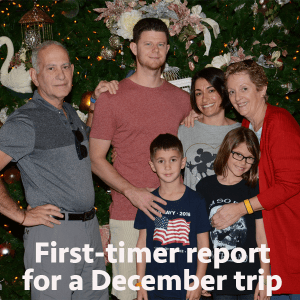 Their trip plans included staying Club Level at the Boardwalk Inn, a VIP tour guide, Memory Maker, Free Dining, some character meals, dessert parties, Candlelight Processional dining package, Universal, and Mickey's Very Merry Christmas Party. Gina recommends the Birnbaum's Walt Disney World For Kids book to help prep children before their trip. They also had a good experience using a car service to get from the airport to their resort. Another reader named Gina suggests that people using a stroller during their trip who are worried about valuables being stolen consider packing 2 bags - 1 with valuables and 1 with other items. When the stroller is parked, just take the bag with your valuables in it. Gina talked about using a stroller for her kids. What type of stroller did she use? Thanks for all of your advice! We are looking forward to our first Disney adventure as a family! Thank you. I very much enjoyed this podcast! I am planning a similar trip for the same week this year- albeit without the bells & whistles. We are also traveling with my parents and staying at the Boardwalk (although we are renting a 2BR villa). No club level or VIP tours unfortunately. After hearing this I am crossing my fingers that Neil Patrick Harris will return for the CP. One thing I was worried about was the weather so I was pleased to hear it was nice. How much is the VIP guide per hour? Also, I’m assuming a 20% tip is customary? Couldn’t have survived without WDW PREP and DLR PREP!! I love the longer shows! I listen while I’m doing laundry! I stream your podcasts from the website. With these long episodes, is there a way to fast-forward to where I left off? I can’t start over every time and will never find an hour and a half to devote to it at once. Help! You can adjust the little progress bar to the right of the play button. You might also consider using a podcasting app which makes it super convenient to take it with you (which is why the podcast is called WDW Prep To Go – because it’s portable) and to stop/start as you’d like.